I generally find that Michael Tomasky makes good points. Tomasky is a special correspondent for The Daily Beast, and he writes regularly on political topics. On July 16, 2018, in a column in The New York Times, Tomasky commented on the nomination of Brett Kavanaugh to serve on the United States Supreme Court. The column was titled, "The Right Way to Lose the Kavanaugh Fight." His column does make good points. It will be the Democrats’ first instinct to attack Judge Kavanaugh on abortion rights and health care. And, indeed, polls are finding very strong support for maintaining Roe v. Wade and pretty strong support for Obamacare. Democrats should talk about those very important things. But they can’t leave it at that. They absolutely must discuss character — both the president’s and Judge Kavanaugh’s. The nominee worked for Ken Starr in 1998 as Mr. Starr pursued President Bill Clinton. What exactly did he do for Mr. Starr? That office was notorious for leaks. Did he leak secret grand jury proceedings, violating Rule 6(e) of the Federal Rules of Criminal Procedure? My gloss on this advice is to say that what Tomasky is really suggesting is that the Democrats treat the "advise and consent" process the way it has largely been treated through over more than two hundred years of constitutional history. Votes on Supreme Court nominations have not, generally, been treated in the same way that votes on partisan political matters and legislation have been treated. That is because the Supreme Court is supposed to be the "non-political" branch of government, the branch of government that is prepared to judge legislation based on the "rule of law," not on the basis of which party has more votes. Our system does depend on "checks and balances," and the role of the Court is to look beyond partisan political majorities, and to consider precedent and the dictates of the Constitution as something different from the individual political views of a particular Justice, or the political views of the president who appointed that Justice. If the people are to believe in an "independent judiciary," and the integrity of the Constitution, then the people need to believe that judges and justices will rule on the basis of the "law," not "politics." "SCOTUS Is Political," The Nation magazine says in its July 30/August 6, 2018, issue, and it is definitely true that the Supreme Court decides on all sorts of political questions. It is also and obviously true that Presidents think about politics as they make their nominations, and that Senators think about politics as they decide whether or not to vote to confirm. 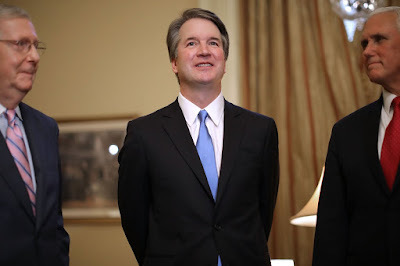 In the case of the Kavanaugh nomination, almost all the discussion has focused on Kavanaugh's views on hot-button legislative and policy issues, and most of the discussion presumes that Justices of the Supreme Court will vote according to politics, not according to some quite different standard, as required by the Constitution. Opposing Justice Kavanaugh's appointment on a purely partisan and political basis undermines our system of government. We need to demand that Supreme Court Justices follow precedent, which helps ensure that there really is a "rule of law" that is different from current politics, and we need to expect and demand that the Justices base their decisions on what the Constitution says (as it has been interpreted over 200-plus years), and not on the basis of their political allegiances. Does this sound like I am out of touch with reality? Doesn't everyone agree that this theory about an "independent judiciary" has no basis in fact, and that, in the end, it's nothing but politics, all the way down? Well, the world is as we make it, and I am urging caution as Democrats approach this nomination process. I hope they will be careful not to convey the idea that we should expect the Supreme Court to be just as "political" as the other two branches of government, and that we fully expect that decisions of the Court will depend on nothing more than just "adding up the votes." Yes, appointments are always "political," but I'm with Tomasky. To fight this appointment, let's look down that "character road," and not concede that we expect the new Justice, if the Democrats "lose the Kavanaugh fight," to be a mini-Trump on the Supreme Court bench for the next thirty to forty years. If that's where we are heading, we are in deep waters indeed!